Need new specs? Wondering if your contact lens prescription has changed? Considering refractive surgery? Now is the time to take care of all of your eye care needs. The New Year is coming fast which means that flex spending dollars will soon expire. If you don't know what "flex spending" means you probably don't have a flex spending account but you should verify your insurance plan to make sure. If you contribute to a Flex Account with your employee benefits check how much credit you have left. Most FSA's obligate you to spend all money you've contributed before the new year or you will lose it! Using your flex spending credits you can get big savings on your optometry needs. 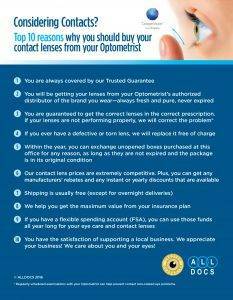 Eye and contact lens exams, glasses, contact lenses, even Lasik may all meet the requirements for repayment. Be aware that some procedures, such as Lasik require advanced screening which takes time so book an optometry visit as soon as possible. Call us if you have questions about your eye and vision care benefits. Our Philadelphia, PA Eye Care Professionals are here for you!